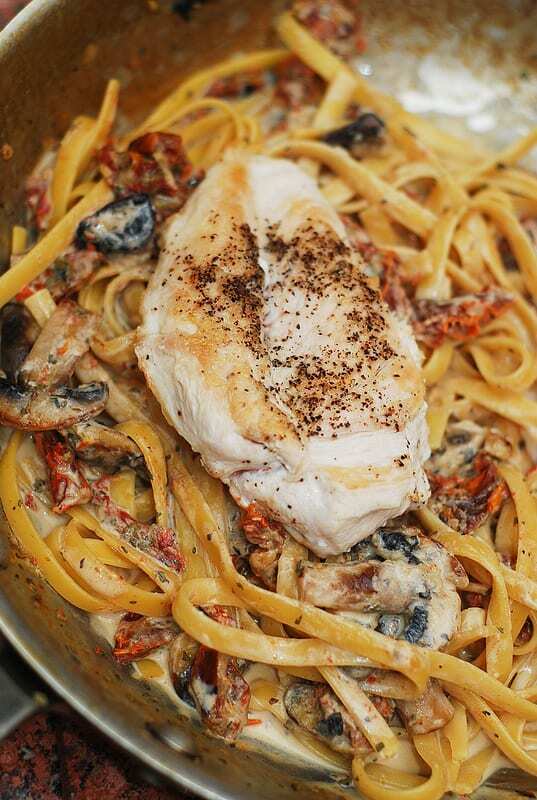 Chicken Breasts with Creamy Mushroom and Sun-Dried Tomato Pasta with Basil and Garlic. Flavorful way to serve chicken breasts! 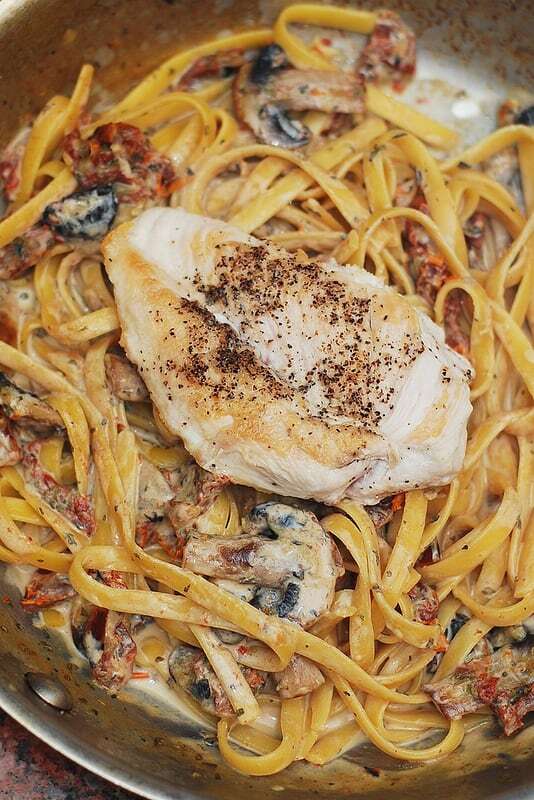 In this recipe, fettuccine pasta is combined with sun-dried tomatoes, garlic, mushrooms and tender, juicy, moist chicken, in a creamy flavorful pasta sauce. There are few pasta dishes that can rival these kinds of flavors! You will love this recipe even more after you make it for the first time because you will see how easy it is and that it takes just a few ingredients and a few simple steps. I’ve made this pasta sauce many times and it’s very popular with anybody who tries it. It’s a reliable and delicious pasta sauce recipe. 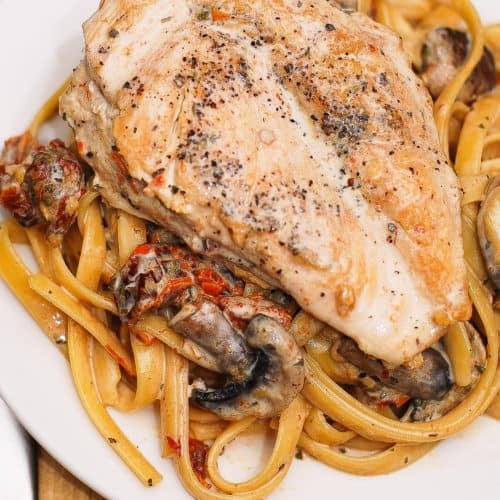 The chicken is soft, tender and very flavorful – you can cook the chicken breasts on the stove top (as described in the recipe below), or you can make your favorite grilled chicken and just use the pasta portion of this recipe as a side dish for your grilled chicken. It’s a satisfying and filling meal, which has both carbs and protein, and it looks great on a plate – perfect for weeknight dinners or for when you have company over. 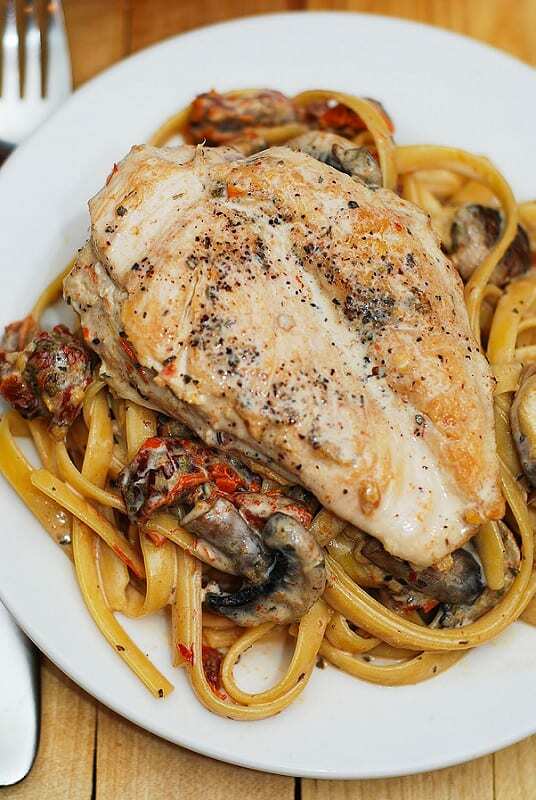 This recipe uses 1/2 pound of pasta and 4 chicken breasts – enough to make 4 servings. Feel free to double it if serving more people or if planning for leftovers. Serve this with garlic bread and a salad. A glass of white wine will make this meal only better. 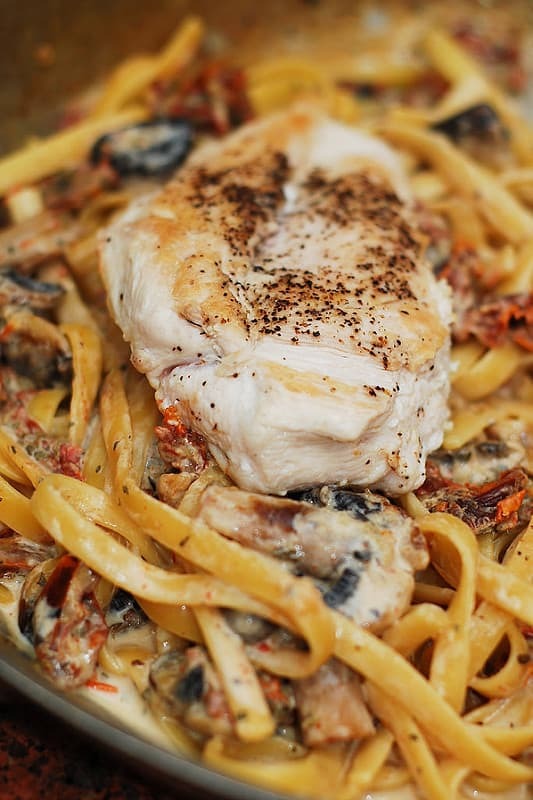 Chicken mushroom pasta with sun-dried tomatoes in a creamy garlic and basil sauce. It’s a satisfying and filling meal that has both carbs (pasta) and protein (chicken). Note: do not add salt to the creamy sauce because it should already be salty enough from the dissolved chicken cubes. Only in the very end when the sauce is done, you may add some salt if needed. Season both sides of chicken breasts with salt and pepper. You can also add a touch of Cajun spice on both sides, if desired. Heat the large pan over medium-high heat. When the pan is hot, add olive oil and swirl it around the pan. Immediately, add the chicken breasts and cook them for 2 minutes on one side. Flip each chicken breast over to the other side, cover, and cook for 2 more minutes on the other side. Flip them over again to the other side, turn off the heat, cover the pan with the lid and let the chicken breasts sit covered for about 10-15 minutes (depending on the thickness of chicken breasts). If your chicken breasts are very thick, you might even need 20 minutes. After 10-15 minutes are over, make a thin incision in the center of one of the chicken breasts to check for doneness and to make sure there is no pink in the middle. Place 1/4th of pasta from the pan on each of 4 dinner plates. Top the pasta with grated Parmesan cheese. Then, top each pasta with a chicken breast. I love to serve pasta with salt and pepper mills, so that people can add freshly ground pepper or more salt to their dish. What is half and half? To make 1 cup of half and half, combine 1/2 cup of milk and 1/2 cup of cream. I made this this afternoon, after pinning and then craving it for a few weeks. I thought it was really great! It was surprising how flavorful the sauce was, considering the simple ingredients. I agree that this is a “go-to” pasta sauce, delicious and seems hard to mess up. I would serve this for company. It was easy, too, though I did end up simmering things a bit longer to reduce the liquid, as I hate a thin pasta sauce, and it didn’t end up too thick. I made it without chicken, and used red pepper flakes and parsley; didn’t have any basil. Next time I’ll throw in a couple handfuls of baby spinach at the end for color and more vegetables. Thank you for the recipe! You’re very welcome! I am glad you enjoyed the recipe! Baby spinach is great in this kind of sauce with pasta. Who can help me, what is half@half in this recipe thanks. Had to come and visit after Monique mentioned this recipe on La Table de Nana 🙂 It does sound wonderful! 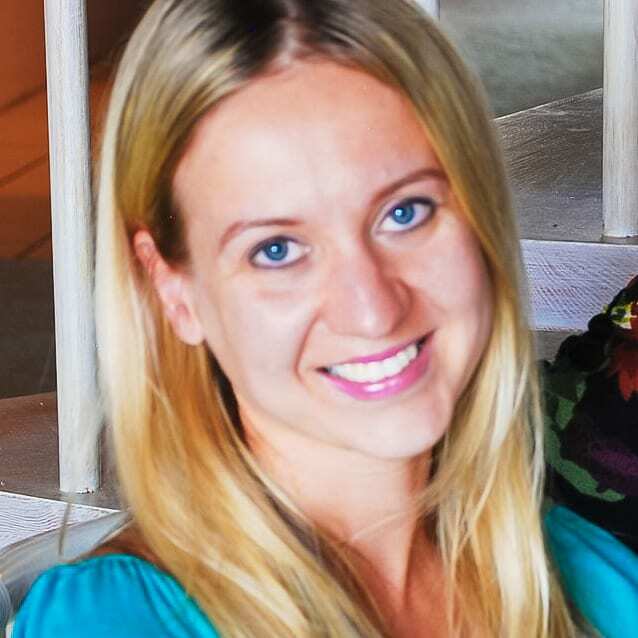 It looks creamy and delicious and easy to prepare too- great recipe ,thanks for sharing Julia.